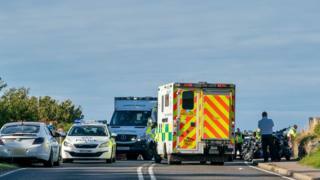 Four men have appeared in court charged with attempted murder after an incident on the A98 in Moray. It happened in the Cullen area at about 16:30 on Saturday. Four men appeared at Elgin Sheriff Court to each face five charges of attempted murder. Kyle Urquhart, 21, Ian Ewing, 42 , and Patrick Noble, 51, all of Aberdeen, and Ian Yeomans, 56, of Peterhead, made no plea and were released on bail.